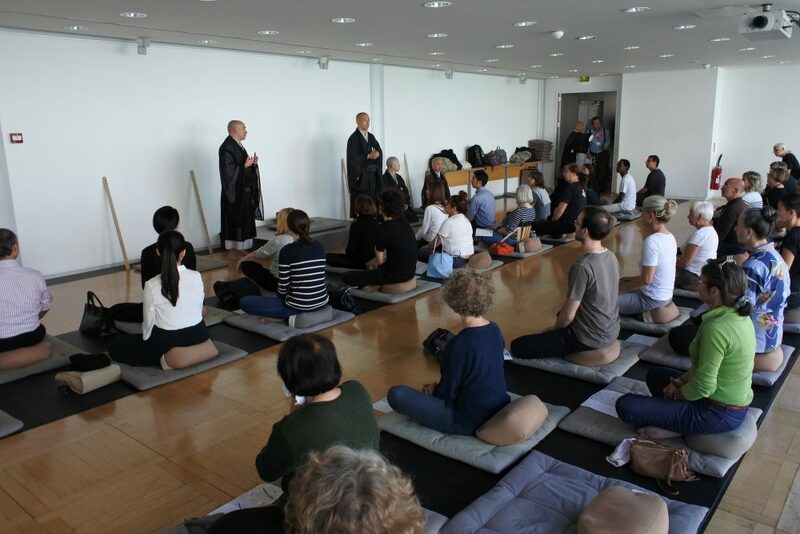 Zen Week was held in Paris from October 2 to 7 as part of Japonismes 2018. 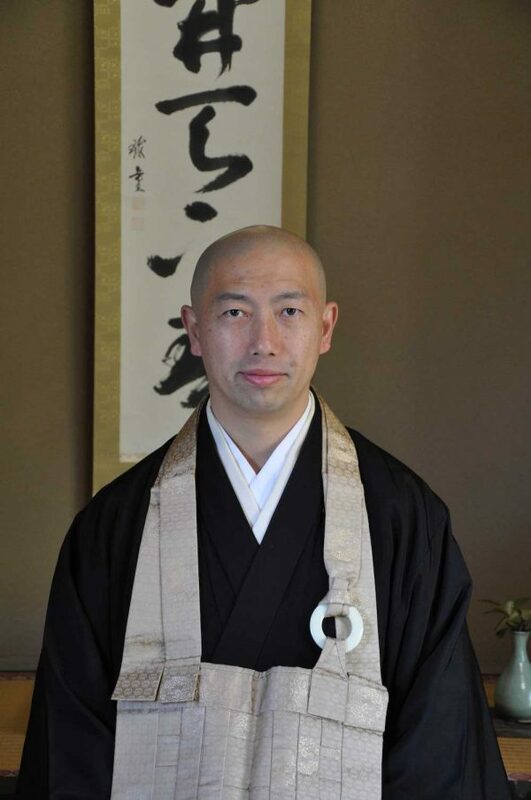 The Great Zen Master (Rodaishi) Nanrei Yokota, Chief Abbot of Enkaku-ji, the Head Temple of the Rinzai Sect, and nine other Zen priests from Japan as well as two French Zen priests from the Lyon area took part in Zen Week. Participants learned about Zen, which forms the basis of traditional Japanese culture, through displays, videos, lectures, group Zen meditation, and shazengo (copying Zen aphorisms with a brush). As we observed French participants listening intently to explanations of Zen, engaging in Zen meditation while sitting in an unfamiliar position, and struggling to write Zen words or phrases with an unfamiliar Japanese calligraphy brush, we could sense their interest not only in Zen, but also in Japanese culture itself, and felt that we ourselves could learn something from their example. Zen meditation is about finding harmony between one’s mind and body. Listening to someone speak is about achieving harmony between that person and oneself. Writing calligraphy with a brush is about establishing harmony between oneself, the brush, and the character that is being written. While Japan is a country endowed with the beauty brought out by the four distinct seasons, it is also a land beset by typhoons, earthquakes, and other natural disasters. In such circumstances, the Japanese people have learned to adopt a mindset that finds harmony with nature. Japanese culture is an expression of that state of mind. 2016: Appointed visiting professor at College of Risk Management, Nihon University. His numerous publications include Saigo no Samurai: Yamaoka Tesshu (“The last samurai—Yamaoka Tesshu”) (Kyoiku Hyoron Sha Co., Ltd.), Zazen no Susume (“An encouragement for Zen meditation”) (Gentosha Inc.), Hana no yo ni, Ikiru (“Living like a flower”) (Gentosha Inc.), Jusansai Kara no Bukkyo Juku (“Buddhism school from age thirteen”) (Kairyusha, Inc.), Mitsu no Doku wo Sutenasai (“Rid yourself of three poisons”) (Kadokawa Corporation), Otoko no Zengo (“Zen aphorisms for men”) (Chiteki Ikikata Bunko, Mikasa Shobo Co., Ltd.), Yamaoka Tesshu Shuyo Kun (“Yamaoka Tesshu—lessons of self-cultivation”) (Katsugaku Shinsho, Chichi Shuppansha), Wasureru Chikara (“The power to forget”) (Mikasa Shobo Co., Ltd.), Obosan ni Narau Kokoro ga Totonou Asa, Hiru, Yoru no Shukan (“A Buddhist priest’s teachings about practices for morning, afternoon, and evening that will keep your mind healthy”) (Discover 21, Inc.), and Anshin wo Eru (“Obtaining a Sense of Peace”) (Tokuma Shoten Publishing Co., Ltd.).